To celebrate the release of our 2 new Expert Betting Reports (The 2014 Betting/Tipster Awards & The Latest SBC Magazine) we are offering you the chance to save £10 on the cost of a Smart Betting Club membership between now and Midnight on Saturday. It’s all part of an extra special ‘flash sale’ where you can gain access to the full Smart Betting Club service with £10 off and see for yourself what all the fuss is about!! To take advantage of this offer, simply enter our special coupon code ‘A3FF’ when prompted on our membership sign-up page and £10 will automatically be deducted off the price of subscription. …But be quick as this offer is only valid until Midnight this Saturday the 22nd February, after which time the £10 saving code will expire! This special £10 off deal is to celebrate the 2 Expert Betting Reports newly available to all SBC members as detailed below. Click each image to see a larger version. You can pick up your copy of both these Expert Reports the instant you join our service at the Smart Betting Club and with a £10 discount if doing so between now and Midnight on Saturday its a great time to sign-up. Your £10 Coupon Code: To take advantage of this special £10 discount, simply use this coupon code: A3FF when prompted at the sign-up page. You will then be able to join at the discounted rate. Expert Betting Report Part 2: The Ex-Bookie Turned Football Tipping Genius…. Today’s report is our very latest SBC Magazine (Issue 86) and features a whole host of independent tipster reviews, interviews, expert analysis and pro gambler advice you won’t want to miss out on. 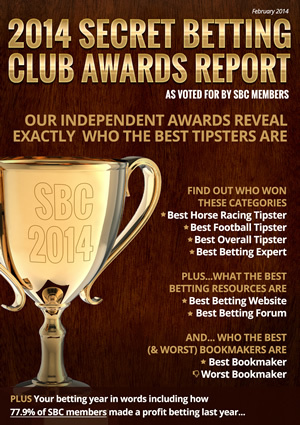 Coupled with the release yesterday of our 2014 Betting & Tipster Awards Report, which highlighted the very best tipsters & betting experts as voted for by our members, its a great time to join us at SBC. It’s an exciting 24 hours here at SBC Towers as we are releasing not one but TWO massive Expert Reports that can have a huge impact on your betting profits. First up we have just released our 2014 Betting & Tipsters Award Report, which reveals everything from the best football & racing tipsters to the best betting expert & website…as voted for by our members. And as these awards are voted for by SBC members, they really do highlight the most deserving winners as they are the people on the ground using them day in, day out as part of their quest to make money betting. I imagine that most of you will have heard the well worn stat that suggests only around 2% of people who place a regular bet actually make money from their betting. This 2% figure is commonly accepted sum these days with even less than that actually making anything resolving even a second income. So why exactly are so few people making money betting you may ask? Well the simple answer is that its tough, especially if you are betting independently and without help or experts to help guide you along the way. Which is where the Smart Betting Club comes in as a recent survey of our members proved with as many as 77.9% of all respondents claiming to have made a profit betting in 2013. Yes that’s right – 77.9%. Nearly as many as 4 out of 5 voting members which compares very nicely to the 2% or 1 out of 50 in the non-SBC world. All of which is proof I like to think of our service’s genuine ability to help your betting. This is a fairly straightforward and blunt email as I think these figures deserve your attention if serious about improving your betting. Some of you might ask why is it not 100% of all SBC members? Well, this is because its realistic as even with the best will in the world, not everyone will follow the right instructions and guidance. Would you really believe me if I said 100% of all SBC members made a profit last year? No and nor should you! How much money did these 77.9% of members make you might ask? After all, even if they made £5 profit this would count! Well we grouped answers into 4 categories and the most popular was the 29.5% who made between £1000 and £4999 profit. Second most popular were the 22.1% that made over £10,000 profit with a further 13.7% a profit of between £5000 and £9,999. Only 12.6% made a profit up to £999 in 2013. We also think this breakdown is quite impressive too as it means 1 in 5 members who voted made over 5 figure sums of money in 2013 and over 35% over £5000. Not bad for the effective daily cost of just 21p to be a member of the Smart Betting Club. And before you ask, all these results were based on a straight-forward poll where we asked SBC members to honestly answer just how their betting fared last year. Each member could only vote once to be 100% fair and accurate. The full results of this poll will be published in our upcoming 2014 Betting & Tipsters Award Report,where as a service we took the pulse of just how last year fared for our members. If you are keen to follow in the footsteps of some of our members and join the majority who win, then its a great time to join us at the Smart Betting Club. This is because we have a special dual report release coming up this weekend featuring our 2014 Betting & Tipsters Report, which reveals the best tipsters, experts and resources as voted for by our members. Not only this but we will also be releasing our very latest SBC magazine this weekend, including new reviews of 1 fantastic football and 1 racing tipster we have uncovered. All of which is covered by our 100% risk-free money back guarantee if not satisfied after you join – now you can’t say fairer than that. Why not try us today and chance your arm at making 2014 a successful year betting with our help. Are These The 3 Worst Bookmakers? 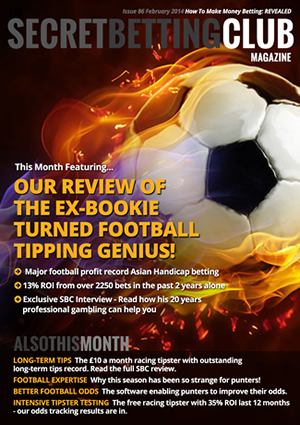 February is an exciting month for us here at SBC Towers as not only do we have a fantastic new magazine out next week (including a new review of a particularly profitable football tipster), but we will also be releasing our 2014 Betting & Tipsters Awards Report as voted for by SBC members. I love these awards as not only do they reveal just who our members rate to run the best tipster services but also the best betting website, forum and experts…and of course the best and worst bookmakers! And as I rate SBC members to be amongst some of the most clued-up punters out there, what they have to say is well worth listening to. So today as a bit of a spoiler I want to discuss the perhaps least-sought after but most highly-competitive award of all – THE WORST BOOKMAKER! A Big Race Meeting Tipster To Rival Pricewise? These days there is a huge amount of racing for us punters to tackle thanks to the seemingly ever increasing number of race meetings now taking place. Whether its low grade evening fare at Wolverhampton or the Cheltenham Gold Cup – there has never been more chances for racing fans to have a bet. Yet does this increase in racing actually benefit us punters? Or are we simply better off focusing on the higher grade meetings and leaving the low grade stuff behind? Effectively, operating like the Racing Post’s Pricewise tipping service. They are the questions we recently posed as part of our analysis of a top racing tipster in our latest Tipster Profit Report, where our examination revealed a major profit boost simply by following his tips in the big meetings. So startling where these findings that if following him in you could make nearly 3 times the percentage gain for around half the work, by betting only during the major racing Festivals and on Saturdays.